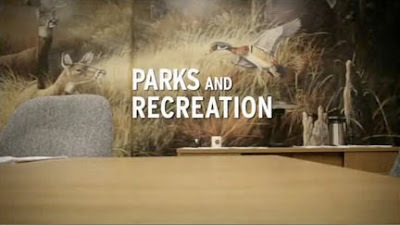 Back of the Head: Parks and Recreation 2x15 - "Sweetums"
Parks and Rec hadn't done a community forum scene since the Venezuelans visited Pawnee and this week's didn't disappoint. I just saw Food Inc. a few weeks ago and the outrage over corn syrup being in just about everything sold in a supermarket or in fast food restaurants is pretty fresh in my mind. This episode was a really good tackling of the issue, with the (stupid) public of Pawnee getting what it wants. (A snack bar made from corn, corn syrup, and sunshine.) But it also was reminiscent of The Simpsons episode from a few years ago when a snack company put sugary snacks in every Springfield Elementary vending machine, causing Bart to become super fat. The ideological battle Ron waged with Leslie over her butting into everyone's business and his right as an American to destroy himself as if he chooses was great. Plus Ron was doing double duty fighting against the government and for privatizing everything. April distancing herself from Andy is such an obvious stall. They don't want to pull the trigger on getting them together yet and they're stalling. What does she see in her gay boyfriend, anyway?